ND to MLB: Billy Sullivan Jr. 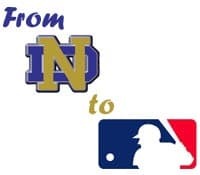 I hadn’t intended to go this long between my first and second post looking back at Notre Dame baseball players who reached the Majors, but other things — other posts, other interests — kept pushing it back. I do hope to take some time to work ahead on a few to have in written and in reserve to keep things fresh around here. These “ND to MLB” posts won’t have any particular order to them. I’ll choose who to feature on a whim, or if something leads me to a certain player or inspires me. That’s the case with Billy Sullivan — actually, that would be Billy Sullivan Jr., as it turns out. Somehow, when I first searched eBay for a Billy Sullivan item, I neglected to double-check the years involved. Most of the lots available are for the elder Sullivan, the catcher who made his name for the early-20th Century White Sox. So without cross-checking, I went ahead and bought a 1961 Fleer card showing Sullivan in a blue Chicago uniform, arms reaching out as if awaiting a hug, catcher’s mitt on his left hand. Somewhere along the line, though — and after I’d received the Fleer card — I realized that the famous Sullivan of the early 1900s was not the one who played at Notre Dame. Both played catcher, and both had stints with the White Sox, but the son debuted, with Chicago, in 1931, while his dad played his last game in 1916. 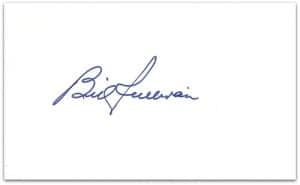 Thankful that the Fleer card wasn’t too expensive, I shrugged it off and came across a reasonably priced autographed index card to serve as my Billy Sullivan, ND ’31, artifact. There was nearly another Sullivan for whom I would have had to track down a card or photo: Billy Jr.’s brother, Joseph (which is also the middle name of both Billy Sr. and Jr.), turned down a contract offer from the White Sox to pursue a law career (as noted in the penultimate paragraph of this bio). 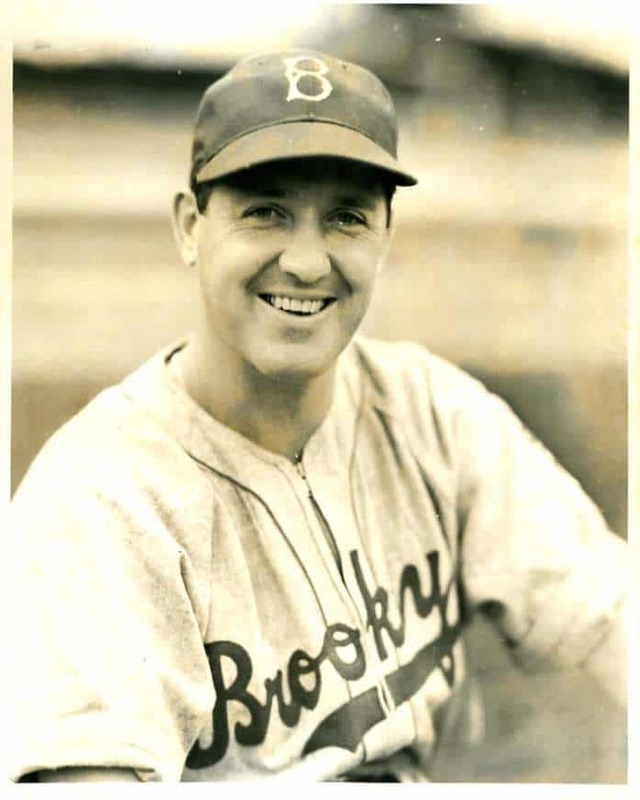 Sullivan bounced around during his career, playing for the White Sox, Reds, Indians, Browns, Tigers, Dodgers and Pirates, with his longest stint the three years with Chicago to begin his career. With St. Louis in 1938, he had the lone hit (a bunt single, according to Cappy Gagnon in Notre Dame Baseball Greats) in the first of Bob Feller’s 12 career one-hitters. What prompted me to go with Sullivan now was a recent post on Seamheads discussing Sullivan Sr.’s curved bat, which had been passed down to Junior. It’s a fascinating read, so I encourage you to check it out. 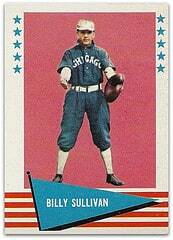 I also learned from that post that the Sullivans were the first father-son duo to play in the World Series, Billy Sr. in 1906 with the White Sox, Junior in ’40 with the Tigers. And because that bit of trivia couldn’t happen until the offspring reached the Fall Classic, it was Billy Jr.’s accomplishment that established the precedent — another notable Major League moment for a Notre Dame man. Finally, just as I was finishing up this post, I went searching for a photo of Billy Jr. to include and came across an amazing collection of artifacts obtained at an estate sale after Sullivan’s death in Sarasota, Fla. (scroll down below the photos or search for “Billy Sullivan Jr.” for the beginning of the archive). If I ever needed confirmation that the index card I bought was signed by Billy Sullivan Jr., I think this contract provides a pretty strong case. Billy Jr. had a copy of the same Fleer card of his father that I bought. A letter from Hank Greenberg. A new phone number announcement from Hank Greenberg’s wife, Caral (nee Gimbel, of the Gimbel’s Department Store family). There’s so much more to look at it could take all afternoon. It’s amazing, some of the things you can find when you’re least expecting it. Proudly powered by WordPress | Theme: Harmoni by Arif Qodari.